David Moss, Thomas Cox, Brian Abramson and Corey J. Lederer, the employees, were the second, third, fourth and fifth people to be hired by Block.one, the corporate parent of EOS. EOS, a computing protocol that competes with the technology behind the bitcoin and ethereum blockchains, supplies a native cryptocurrency of the same name. According to LinkedIn, Abramson, Lederer, Cook and Mason left Block.one and EOS in the summer. Moss already quit by May, a month before Block.one published the EOS main network. EOS launched two test networks last year in September and December and two test networks this year in January and May. The main network was released as an open-source software platform in June. “We left because we saw a need in the blockchain marketplace that Block.one was not going to address,” one of the former Block.one employees said, but did not specifically comment on StrongBlock’s strategy to improve the EOS blockchain. StrongBlock CEO Moss has also said “EOS will be a 787 and StrongBlock will be a custom 787 factory” in a comparison of the two blockchains, according to a live tweet of the Global Media Blockchain Summit in Los Angeles last month. The four employees, who joined Block.one last year, took on overwhelmingly technical roles. Starting in August 2017, Moss was the senior vice president of technology operations and Cox was the vice president of product. Abramson, the vice president of infrastructure, and Lederer, the senior director of technology products, on-boarded in September 2017. Software developers Jon Eric-Cook and Michael S. Mason, the contractors, began remote work on EOS in spring 2018. The ex-Block.one associates formed StrongBlock in July 2018 with Branden Espinoza, an EOS governance specialist. Their departures have opened up a talent vacuum yet to be filled on Block.one’s leading technical team. Block.one had recently raised billions in investor money and initiated the early stages of a core product roll-out on EOS. StrongBlock is in stealth and does not plan on releasing its product soon. In August of this year, Block.one completed a year-long, $4 billion initial coin offering (ICO), the largest crowdfunding event involving the sale of a new cryptocurrency. The Block.one ICO priced EOS virtual currency, at the time an ethereum token, by market demand. 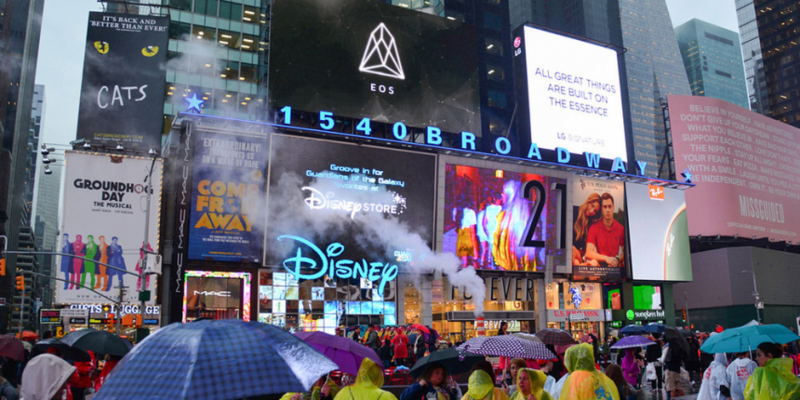 One EOS reached over $20 in April and the EOS blockchain reserved $1 billion of the raise for development and financing. Today, EOS’s market capitalization is valued at more than $5 billion. A bevy of billionaires were among those who bet big on Block.one. Venture capitalist Peter Thiel, hedge fund managers Louis Bacon and Alan Howard and cryptocurrency mining giant Bitmain invested in the funding round that ended at the ICO’s close. Galaxy Digital CEO Mike Novogratz, Christian Angermayer and Lansdowne Investment Company Ltd. participated in a previous round, a company press release said. Other investors included Fred Wilson’s Union Square Ventures and Multicoin Capital, a Texas cryptocurrency investment group backed by Andreessen-Horowitz and Chris Dixon. Dixon bought EOS without investing in Block.one in May 2017 around when co-founders Brock Pierce, CEO Brendan Blumer and CTO Dan Larimer introduced EOS. Blumer, a 32-year-old video game entrepreneur, sold gaming accessories startup Gamecliff to Internet Gaming Entertainment when he was 19. Larimer, who is 36, is known for building decentralized cryptocurrency exchange BitShares and blockchain social media network Steemit. Pierce, who is also chairman of the Bitcoin Foundation and co-founder of the Tether stablecoin and blockchain fund Blockchain Capital, no longer held a role at Block.one after the HBO talk show “Last Week Tonight” aired a March segment about cryptocurrency. On the show, host John Oliver jabbed at Pierce’s eccentric lifestyle, out-there promotion of EOS and leadership at Digital Entertainment Network, a 1990s dot-com company that allegedly ran a Hollywood pedophilia ring from a Los Angeles McMansion, according to lawsuits filed in California accusing two DEN executives and Pierce, now 37 years of age, of sexually assaulting three underage males at house parties. One of the executives, DEN co-founder and then-CEO Marc Collins-Rector, was previously arrested and convicted for sexually abusing a minor in New Jersey. EOS claims to solve bitcoin and ethereum’s scalability, smart contract writing and decentralized functionality issues with delegated proof-of-stake (DPoS), a type of governance model for validating blockchain units to prevent network attacks and faulty transaction recording. DPoS, a hybrid of the bitcoin blockchain’s proof-of-work (PoW) and the ethereum blockchain’s proposed proof-of-stake (PoS) consensus mechanisms, asks users to vote on “witnesses” to confirm blocks. 21 nodes produce the blocks to be controlled by parties pre-selected by EOS. In contrast, PoW and PoS users expend computing resources. PoW network participants verify blocks by mining randomly generated cryptographic hashes without being given special preference, whereas block overseers for PoS, a closer relative of DPoS, are assigned mining power based on the amounts of cryptocurrency they hold. PoS and DPoS have been widely criticized for enabling subjectivity and centralization of network decision-making. Staking model skeptics caution PoS and DPoS super-majorities can band together to make validation slower and less neutral than in PoW blockchains. These concerns over unduly influenced collective interests came into full view when the entire EOS network froze on June 16, two days after the first version of EOS was released. Block producers locked 7 accounts the next day to stop malicious actors from hacking into wallets and stealing user funds. Five days later, the EOS Core Arbitration Forum (ECAF) executed an “Emergency Measure of Protection Order” to halt inbound and outbound transactions for 27 wallet addresses without explanation, stoking outcry claiming the bans set a dangerous precedent of terminating users and reversing transactions without cause — a risk not seen on the bitcoin network. A block producer, who was dealing with a medical emergency, was threatened with a lawsuit the following week for failing to comply in a timely manner with another ECAF order that instructed him to update a network configuration, according to screenshots of WhatsApp conversations posted by several users on Twitter. Larimer, under pressure from the controversy, sent out a statement recommending the dispute resolution body retreat into a passive role. Since going live, the EOS network has struggled with defective source code. The EOS bug bounty program awarded a freelance software developer 6-figures on the first day of the main network’s release at a rate of $10,000 for every error patched. Kyle Samani, a managing partner at Multicoin Capital and a vocal supporter of EOS, has not been discouraged. In a June interview with Fortune, Samani admitted EOS has made mistakes but compared them to the rough start he says the ethereum blockchain has overcome. Multicoin Capital owns large positions in both ethereum and EOS. The fund has highly praised EOS in particular for its scalability, interoperability, low transaction fees, on-chain governance, arbitration constitution and inflationary economics in a glowing review downloadable for viewing on the fund’s website. Last week, Israeli decentralized cryptocurrency liquidity protocol Bancor publicized a cross-chain expansion from the ethereum to the EOS blockchain that will leverage EOS’s transaction speed and cost-savings. BancorX, the anticipated product in the move, will trade between ethereum and EOS tokens issued from ICOs and decentralized applications. The network could only conduct about 4,000 transactions at most at any given time, Moss clarified. As of June, ethereum ran 8 decentralized applications with 300 or more active users, and EOS ran three. Ethereum launched in 2015. Block.one did not respond to requests for comments about StrongBlock and the departures.